From September 14-16, 2016 Östersund, UNESCO Creative City of Gastronomy, will host the 10th Annual Meeting of the UNESCO Creative Cities Network. Representatives from all 116 cities of the Network, belonging to the clusters of craft and folk art, design, film, gastronomy, literature, music and media arts will share the strategic objectives and operations. They will also discuss the main topics: fostering the culture and the creative sectors as drivers of sustainable development and maximizing the potential between the cities and rural regions. During the meeting four parallel transversal thematic workshops will also be held, highlighting global topics and trends, covering core values of the UCCN and fostering exchanges and cross-cultural cooperation. 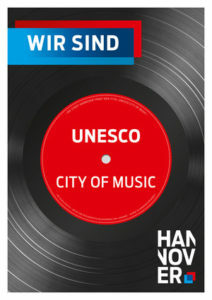 Since Hanover has been appointed UNESCO City of Music in 2014, the city also profits from the benefits of the network and is very active to make sure that the city lives up to its title.